I've just acquired and finished setting up a new wooden plank computer desk. Upon finishing the new setup I naturally went to use my keyboard and noticed that the wooden planks aren't exactly flush resulting in my keyboard wobbling with each keystroke as shown below. What simple solutions could I implement to my keyboard to stop this from happening? I'd like to keep the solution's visibility minimal. I've contemplated using Sticky Tack to level the keyboard but the thought of seeing a blue blob on the bottom of my keyboard daily does not blend well with my OCD. This is happening because there is a gap of space between a corner of your keyboard and the desk. Your goal, as you may have guessed, is to remove this gap. As thick as the gap. Solid at room temperature, occupying a region of the known universe's three spacial dimensions. Ideally low enough density that its mass does not exert a significant gravitational pull on surrounding objects. Non-toxic through skin contact. Non-toxic to any pets you may have. Stable (non-radioactive), inert (non-reactive, at least with your desk, keyboard, and air), and either non-magnetic or possessing a magnetic field with an intensity low enough to not damage nearby sensitive objects. Generally anything harder than the material you wish to cut with a wedge-shaped edge that can be driven into the material to separate it. Some materials can even be torn by hand. Another option is something larger but soft, so that it can deform to an even surface. Many such things exist. Things like mouse pads, placemats, pieces of random soft material that you may have laying around or see online. Using imagination and your lifetime's worth of experience with physics, you should be able to find such a material. 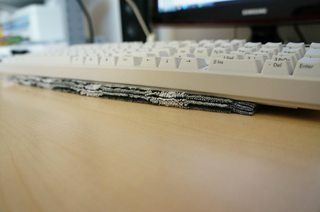 Once you find this material, insert it into the gap or under the keyboard. "But wait!" you say, "Every time I move my keyboard, the material slips out!" Well, as you may have noticed throughout your life, the problem of preventing one thing from moving relative to another thing has many established solutions. Your goal is to find some sort of material or compound that will allow your chosen gap filler to remain in place relative to the desk or keyboard. For inspiration, your local dollar store's school supply section or local hardware store's adhesive section may be of use. Some materials may not even need to be cut, and may fit all of the above requirements. For example, using my power of logical thinking, and remembering things that I have seen before, I am able to recall that these are possible options. Perhaps you have some laying around that you haven't used. Of course, the "best" (that is, it'll really solve the issue) option is to level your desk, for which tools such as hand planes exist (if you find the video unsatisfying, there are others in the related video list), as leveling uneven wood is also a problem with well-established solutions. If the desk already has a finish, though, you'd have to refinish it. Still, a job well done can be fun and satisfying. Alternatively, if you purchased the desk new, and it is warped, consider exchanging it for one that is not warped. 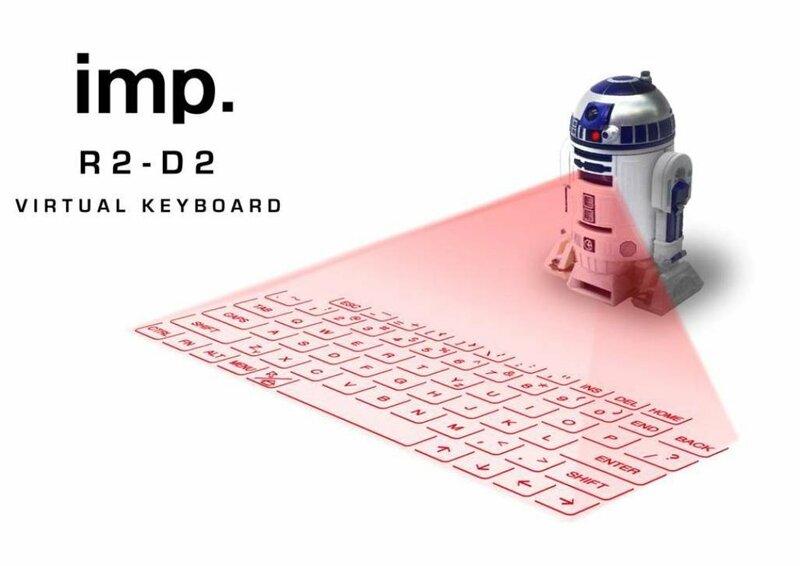 Why don't you put one cloth (little bit thick just like towel) flat on your table and then put your keyboard on it. If it works then great but if it wobble again then fold cloth from that end where it is wobbling and then you will get leveled keyboard easily and you can adjust by your own. 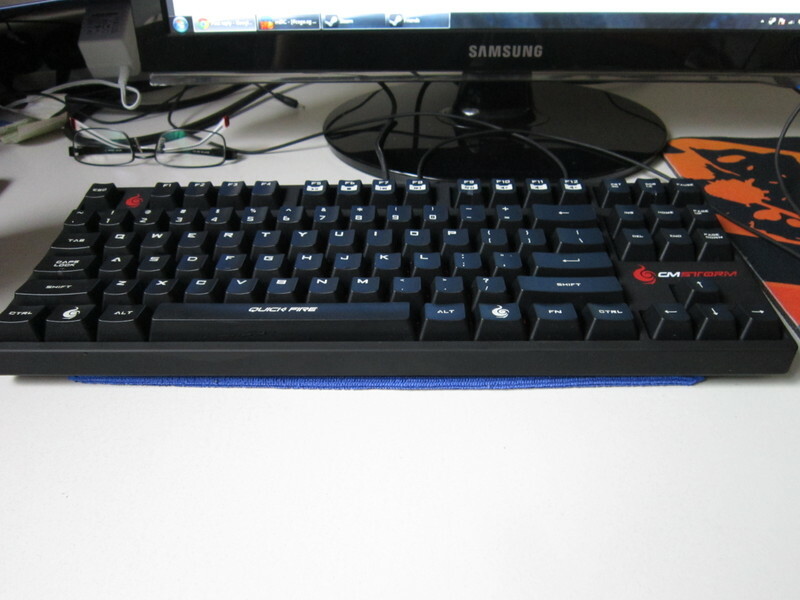 This is the only simple way to stop keyboard wobbling. Here is the image which are kept just at front edge of keyboard. I realize that the question states "I'd like to keep the solution's visibility minimal" as one of the goals, and plenty of other answers have suggestions for modifying the keyboard, but I'm going to make a case here for instead modifying the desk, while focusing on the solution being visible-but-attractive, rather than invisible. Using a keyboard on an uneven surface is just unpleasant, all of the shimming and bracing in the world can't change that, and those solutions tend to become further annoyances over time. Shims slip, keyboards shift, etc. Your keyboard should now sit perfectly stable, and the plate's only 1/4" thick so you won't even notice it when typing. That's what I'd do, if this was the desk I'd be using my computer on every single day. If you slowly begin turning your keyboard on its vertical axis, it will come to a stable resting point before you've made a quarter turn. Perhaps not the most convenient for use, but it fits the criteria of your question ;) And who knows, maybe you'll get lucky and only need to turn it a few degrees. I have a piece of non-slip grip mat under my keyboard. Not only does it stop this problem, it makes the keyboard much quieter and more pleasant to use. A simple solution would be to place a shim of the correct height under the keyboard. Because the keyboard won't always be in exactly the same place, you need to be able to adjust the height of the shim. 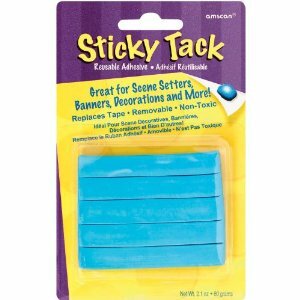 Something like sticky tack is a good solution. If you place the sticky tack under the battery holder, it won't be visible when you're using the keyboard. Place a lump of blue tac in the centre of the bar that runs the whole way along the back of the keyboard. That would make a tripod, and tripods don't wobble. To aid in quietness etc, place a piece of felt on the blue tac. Get a long stick (longer than the diagonal of the KB) and half the thickness of the gap. Place it diagonally under the KB. Have it fitted with magnets, so it can stay with the KB, which you might have to attach two metal pieces to somehow. Everything can be painted in an OCD pleasing colour. That gap isn't very large. You can twist your keyboard by hand in small increments to fit the surface of your table. The keyboard may appear fairly stiff, but it will conform to the table with some effort. A better course of action, though, is to get a Bench Plane and simply flatten the surface of the table, at least around the keyboard area. Shouldn't take too long. Get a piece of double-sided tape. Stick one side of it to the keyboard. Leave the backing on the other side so it doesn't stick to the desk. Sorry if this is making your OCD worse, but I think the problem is that your table is standing imbalanced. You should first attack that. The keyboard is in itself well balanced, so any solution you find for the current position on the table will probably not work 20-30 cm to the left or the right or when you move the keyboard to the middle of the table to put a book or piece of paper in front of you. In your screenshot you either have to lift the front left leg or the back right one to make it even again, use some marbles or a water level to find out which one. On most phones there is an app, that if you calibrate it right works pretty good. It might also happen that you need to adjust 3 of the 4 table legs. Get a piece of aluminum foil and fold it until it is big enough for you to put it under the keyboard and keep it stable. Not the answer you're looking for? Browse other questions tagged home technology comfort or ask your own question. How do I make a wobbly keyboard key stable again? How to fix a keyboard with a missing leg? 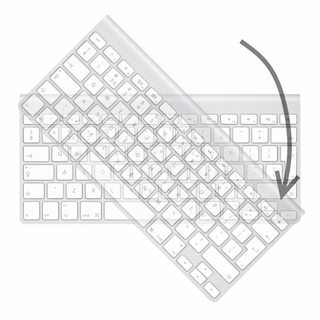 How can I improve my wireless keyboard & mouse reception? How to make my keyboard not sticky? How to turn Non-Backlit Keyboard to a Backlit Keyboard for laptop?